I was having an OK pain day. My quadratus lumborum was feeling pretty good. I went to have a bit of milk chocolate, and I literally felt that muscle tighten in my back, and I was in pain. Then I got to thinking. Many times I will get up in the morning, and I will feel fine, but as the morning moves on, my back feels worse, even though I have done nothing to irritate it. All of a sudden, I thought, "Maybe it is caffeine that is causing me more pain." I realized that if it did it for that little bit of chocolate, then my chai tea (I have four cups of chai in the morning but it has 2 tablespoons of orange pekoe black tea is a LOT of caffeine. ), it was probably the source of my unexplained pain later in the morning. BINGO. I skipped it for two mornings, and I had no pain. This is an Oregon Christian author. I read another book by her that was written in 2009 called A Land of Sheltered Promise. I enjoyed the historical subject matter about Oregon's history of the Rajneeshee, a cult that took over the little town of Antelope, Oregon back in the 1980's. We prayed and prayed, and they left as quickly as they came. Now it is a Young Life Camp (Two of my friends were instrumental in acquiring the land, and they are mentioned in the story with pseudonyms.). It was fascinating history, but I did not care for the fictional story that surrounded the history. Some people think I am a "P" (like to constantly take in more information and not necessarily keen on always making a final decision and therefore more open, laid-back and flexible) personality type. They enjoy the PROCESS involved in making decisions. I am decidedly (but not strongly) a "J" (like to take in only enough information necessary to make a decision). We enjoy the CLOSURE involved in making a final decision. I had a lightbulb moment this morning. 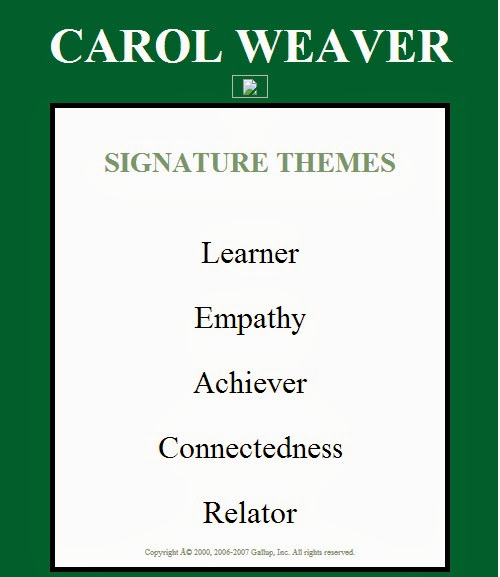 I think that people might think I am a "P" because my NUMBER ONE strength in the StrengthsFinder is LEARNER! I love to constantly learn new things. I think it makes me balanced to have a "J" personality type and also a strength that likes to learn new things! I love learning more information, but I also love to have CLOSURE! Dallas Willard on the Bible: AMEN! Its purpose is practical, not academic. An intelligent, careful, intensive but straightforward reading—that is, one not governed by obscure and faddish theories or by a mindless orthodoxy—is what it requires to direct us into life in God’s kingdom. Any other approach to the Bible, I believe, conflicts with the picture of the God that, all agree, emerges from Jesus and his tradition. Willard, Dallas (2009-02-06). The Divine Conspiracy . Harper Collins, Inc.. Kindle Edition. I did not dislike this book, but it just seemed to drag on and on. He made his point and drew it out too long. I know many people like this book. So no offense. He advocates that "Creation to Christ to End Time Consummation" is the whole gospel. He looks at what Jesus, Peter, and Paul meant when they said "gospel." I do not have tons of time this morning. I got out of bed at 3:30 am (that is what I get for falling asleep at 9:30 pm! ), and it is a prayer and fast day for me from sunrise to sunset. So, I had a little of my tea and am enjoying time in the Word.